There is a guy named Don who sits alone in a clubhouse box and charts the odds with each click of the tote board. His is a lost art, as much a throwback as anything else to the bygone days when bookmakers set the line on a blackboard with chalk. 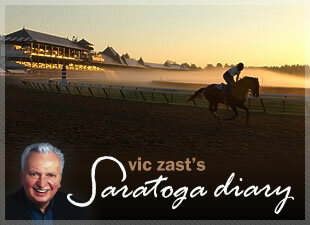 But this is Saratoga, and not everything needs to make sense or fit into a logical paradigm. That’s the charm of it. What might work for Don may not work for you, and if so, does that make him unusual? Even a person who picks horses by colors or names has a chance here. Handicappers such as Don, who watch the betting intently, must have figured that Casual Drive would have upset the odd-on favorite in the fifth race. At least, the money was moving in the colt’s direction. With Edgar Prado named to ride by Rick Dutrow, Casual Drive’s odds opened at 14-1, quickly settled at 6-1, and ended up at 5-1 when the bell sounded. Instead, the 2-5 Rollers, trained by Barclay Tagg, won as widely suspected. Trainer Michael Hushion, who was operating with three new stents in his arteries, saddled Oniyome to triumph by a nose in the third. Because the fourth was a five-furlong dash, trainer Linda Rice was victorious with Saturdaynitesandy. In the seventh, Fancy Diamond held Loving Vindication safe by the slimmest of margins. The width of a nostril kept the Lael Stables’ 3-year-old colt from getting place money. The winner paid $2.90, $2.40 and $2.10. At prices like these, the margin should have been bigger. Next time out for Rosa Grace, please remember how gallant she ran in the $150,000 Lake Placid Stakes (gr.II). Backseat Rhythm, ridden by Javier Castellano, cleared the field comfortably. But the British-born filly, only five days on these shores having come here from Ireland, appeared more accomplished than her 12-1 odds while ending second. In the final race, the Ken McPeek-trained Tar Beach, ridden by Robby Albarado, out-gamed Take the Points trained by Todd Pletcher with J.R. Velasquez, the meet’s leading rider. It’s not the last that you’ll hear from these 2-year-old colts. Ditto for Toby the Coal Man. Making his first start, trainer Nick Zito’s protégé of Mineshaft, finished a respectable third. A day of such splendid competition would not be complete without a little unscheduled excitement. Another runaway horse treated the fans to the fun of a merry chase. A.P. Light ran clockwise at top speed for a half-mile with Sebastian Morales hanging on. Who knows where she might have gotten in the fourth had she entered the starting gate and ran in the right direction? In the race for taste supremacy (Soup Division), Mouzon House’s seafood gumbo, available on Restaurant Row, is becoming a threat to unseat the racetrack’s clam chowder as “best in house.” No ifs, ands or odds about it.